I have just finished reading César Hidalgo’s Why Information Grows – the Evolution of Order, from Atoms to Economics. This is a flawed work. But the author is on to something – and something rather important. 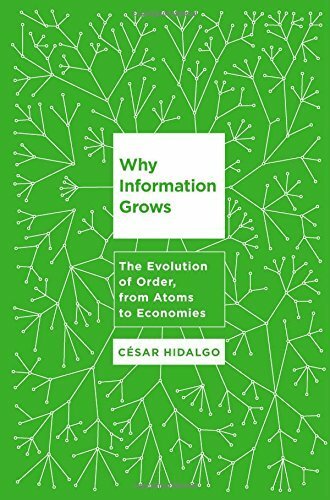 Mr Hidalgo’s key insight is that it helps to understand economics as part of the advance of order, or information, against the tide of ever increasing entropy – the advance of disorder that is the central insight of the Second Law of Thermodynamics. I have abandoned the book. Any bleeder knows that books are never finished, only abandoned. Yet I hope to have reached a point at which the orphan I produced is mature enough to find a home in most people’s heads. Alas for most people he has not achieved that maturity – the ideas were to big to catch and consolidate in the time he had. But I am glad that he did “abandon” when he did, rather than keep his insights private for another few years while that extra maturity came about. It has found a home in my head. The advance of order and information on Planet Earth is the great wonder of our existence. For some it is proof of God, for it can only be the work of an imagination. But for others, who do not believe in such a God, or for whom God works in altogether a different way, this wonder is a puzzle. Mr Hidalgo describes in general terms how such a thing can come about. A system out of equilibrium can generate order from its unravelling; this order can be stored in solid matter as information. We advance because our Sun is in the long process of self-destruction and because our planet has solid matter in which the information can be stored. This advance of information took place though the formation of life on earth, and on to the civilisation created by humans. Mr Hildalgo’s starting point for the book was his realisation that this is that economic advance (a word I prefer in this context to “growth”, the word he uses) is another facet of this process, and that this insight helps us to understand economics. But his postscript describes how he was overcome by the banality of this observation, and how then strove to describe something altogether bigger. If he is going to talk about economics, he needs to move beyond his understandable feelings of its banality towards an understanding of what economics is for, and then trying to work with that. He hints at it but leaves no time to develop his thinking properly. He is right that the idea of economic growth is not much in itself. But what economics should be about is advancing the wellbeing of humanity without destroying the planet that it inhabits. And that must be seen in terms of the growth of information, and not, as far too many people see it, as the consumption of energy and the creation of physical artefacts. Now let’s move on. Mr Hidalgo’s thoughts on economics flow from an appreciation of the critical constraints on the growth of information in human society. This is set by the physical capacity of the human mind to retain and process information. People can organise as teams in order to acheive beyond their personal capacity, but this too has constraints imposed by what organisations and social networks can do. He draws on the insights of the great lawyer-turned-economist Ronald Coase, amongst others, to explain the implications of these constraints. These show why it is so difficult for “developing” economies to catch up with the developed world, for example. It is through understanding how organisations and networks manage and create information that we can understand the direction needed for human advancement. Interestingly he does not feel the need to discuss whether massive computing power and databases help in this process (or I missed it if he did). We tend to associate the word “information” with them. But these things are really very limited in their power to think and imagine, and we often confuse information with data. Still, there is an interesting discussion to be had about the role advancing artificial intelligence might play. Economists often show what is referred to “physics envy”. This is the wish to reduce their discipline to some elegant natural laws which are susceptible to mathematical treatment. And yet, as somebody who has studied physics for real, I wonder at how little comprehension of physics economists generally have. By and large they haven’t got beyond the First Law of Thermodynamics, and systems in equilibrium. And yet physics (and chemistry come to that) only gets at all interesting and useful when you get beyond these basics. I remember that light bulb moment when studying Chemistry A-level when we moved from the stable predictable world of thermodynamic equilibria to the crazy world of kinetics, where most of the real value lies. And yet the economic models the world uses, and around which the world of economics revolves, are fundamentally based on equilibrium thinking. So if economists have physics envy, Mr Hidalgo’s ideas are exactly the sort of direction they should be looking to move forward. But, alas, macro-economists in particular would prefer to pontificate about comfortable aggregates like GDP, inflation, productivity and money supply as if these were genuine physical phenomena. An information-based outlook would change the way we viewed economics. We would see that Saudi Arabia is not a rich country, but a poor one, as its economy is based on oil rather than the enrichment of information. And we might understand better why making organisations, and systems like national economies, big often makes things worse rather than better. It does so because these big places tend to concentrate their information development into tight networks at the power centres, leaving much of their human potential under-utilised. It isn’t that theoretical economics itself offers any basis for so-called economies of scale. In fact the idea goes against the oft-used maxim of diminishing returns, which economists like more for its convenient mathematical consequences that any real grounding in reality. But economies of scale are the language and self-justifying belief system of political and commercial power. Advancing productivity, it is said, is the key to economic success. Bigger systems are more productive. So we must make everything bigger. For an example of this, look at the case being made for expanding Heathrow Airport. Economists are unable to present a serious counter-narrative, it seems, though a few are uneasy about this logic leading to monopolies. The most important thing about Mr Hidalgo’s work is that it starts to give us a strong theoretical language with which to tackle one of the biggest social and economic issues of our time – the under-utilisation of human resources through the consolidation of large governmental and commercial networks – which lies behind growing inequality. It also helps us with another issue – the commonplace assumption that we must choose between improving the lot of the poor and protecting the future of our planet. By thinking about information and networks, we break the stranglehold of thinking about the world in terms of money and physical things. That holds a lot of promise. Matthew, your point about economies of scale is well made. It is a fallacious argument in relation to productivity, especially in the public sector realm. large public sector contracts has a number of damaging consequences with no increase in efficiency. All this evidenced advice is ignored by politicians who seem seduced by economic models that gave us the destructive industrial farms and battery hens, i.e. everything todo with unit costs and nothing to do with human needs. Yes indeed, the groupthink runs deep. I think it is worrying evidence that politicians are becoming beholden to big corporations and their lobbying. A large part of my work career consisted of running outsourced services, and helping to sell. Believe me, I know the strengths and weaknesses of that model. Prof Seddon is entirely right in his diagnosis – though I don’t think I’d formulate the solution in the same way. Control by workers can have adverse consequences if they have no stake in the outcomes. The key to solving such complex problems is to reduce the scale to make them more manageable. It can be well understood with the concepts explained by Mr Hidalgo.